I am lucky enough to have a small population of these beautiful and notable spiders in my garden. Their distribution is mainly confined to London and south Essex, although there are records from Gloucestershire. In this West London garden they have taken up residence on ivy which in turn has consumed the fence, adjacent to the ivy is a rose bush and Fatsia japonica - the spiders can be found here too and they seem to be very keen to set up shop on the latter. 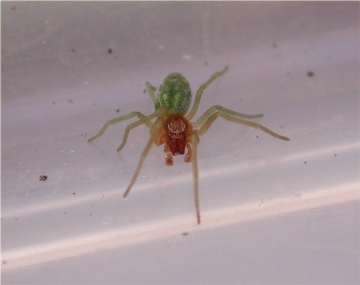 I have tried to photograph them before with little success as the spiders are quite small (3-4 mm) and the leaves on which they reside are very reflective. On a late August morning I spotted a male wandering around the F. japonica leaves in search of a female. I'm sorry to say that I missed any courtship between the pair as I had rushed in the house to retrieve my camera and upon my return I found the couple embraced. The male appeared to lift the female free from the leaf surface and in this position the couple remained for a period of 5-10 minutes. At the end of their copulation there was a brief struggle with the pair dancing around the leaf before the embrace was ended. Curiously, the male stayed put, occupying his mate's web, whilst she ran away onto another leaf. The male remained alone in her web for a period of 24 hours, after this time he was gone. I found it odd that the female ran away leaving the male in her web. I have witnessed this phenomenon on two separate occasions, however, and I have also seen a male and female sharing a web, although whether mating had taken place in the latter case is not known.